The clock face has a 12 inch diameter and is marked out in an inner and outer dial. The hours are marked in large black digits on the inner dial. 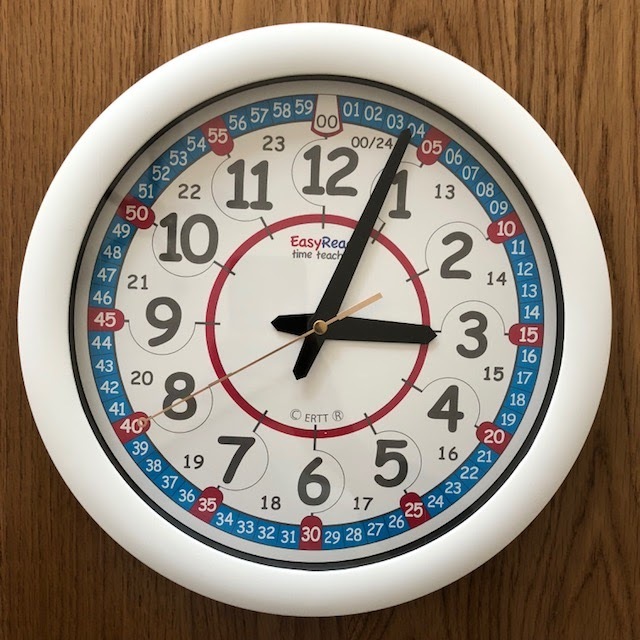 What makes this EasyRead Clock interesting is that it also has the 24-hour markings alongside the more conventional 12-hour ones. The minutes are written as numbers from 0 to 59 on the outer dial. All the numbers are set out clearly in distinct boxes and the clock hands are long enough to penetrate individual boxes. This means there is no ambiguity and telling the time becomes quite simple. Guide the child to read the big number at the end of the short hand. This is the hour. Follow it up with the number at the end of the long hand to read the minutes past the hour. Once they can read numbers (which, by the way, means they can now easily read any digital clock), step it up by introducing the 0’clock. Next, move on to the half past, quarter past and quarter to. J has liked using his new EasyRead Clock. He is comfortable reading numbers and is confident with the 0’clock. We have now moved up to reading 24-hour time. He enjoys trying to work out if he should use the 12 or 24 hour time, depending on whether it is before or after midday. 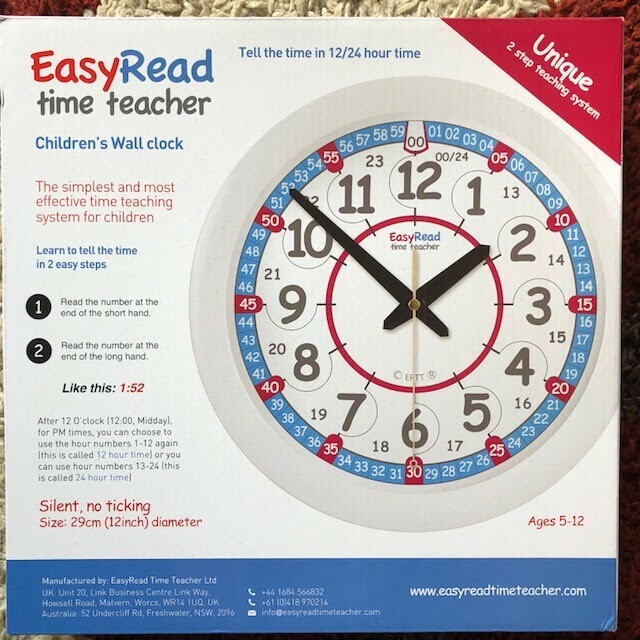 The EasyRead Time Teacher 24-Hour Wall Clock retails at £24.95 and is available in red/blue and rainbow colours. 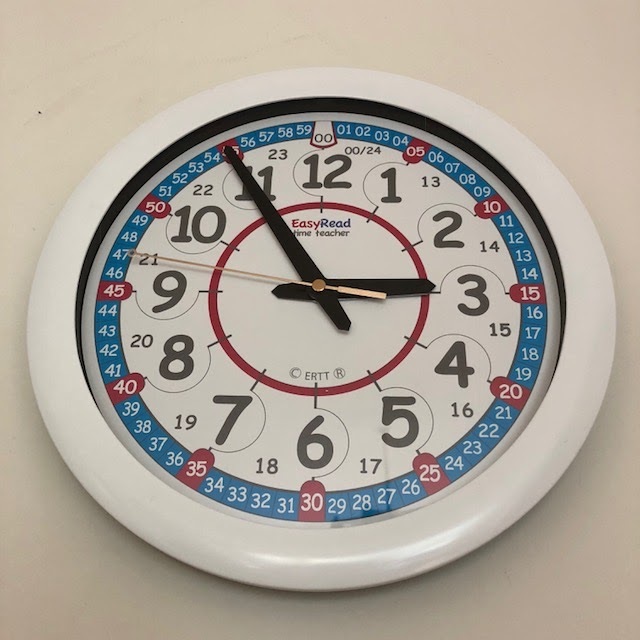 Disclosure: We were sent the EasyRead Time Teacher 24-Hour Wall Clock for the purpose of this review. All opinions are my own.